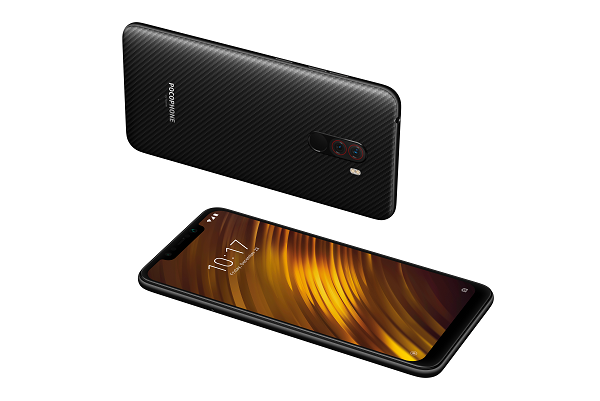 Xiaomi unveils POCOPHONE F1 with 6.18-inch FHD+ display, up to 8GB RAM and 4000mAh battery. POCO, a new sub-brand from Chinese electronic company Xiaomi, made its debut today at an event held in New Delhi, INDIA. POCO F1, the brand's very first smartphone, features Qualcomm Snapdragon 845 platform, LiquidCool Technology cooling system, up to 8GB RAM and 256GB UFS 2.1 storage and a long-lasting 4000mAh battery. The POCO F1 features a 6.18-inch Full HD+ display with 2246 x 1080 pixel resolution, 19:9 aspect ratio and 500nits brightness. POCO F1 comes with a Qualcomm Snapdragon 845 SoC paired with the highly efficient LiquidCool Technology cooling system. POCO F1 features a 4000mAh battery that can sustain 8 hours of non-stop gaming. Coupled with up to 8GB LPDDR4x DRAM and super fast 256GB UFS 2.1 storage. With a new POCO Launcher, POCO F1 comes with an app drawer that can automatically categorize apps, helping users finds apps easily. In India, MIUI for POCO incorporates taxi, music, and video streaming services for an even more robust user experience. Based on Android 8.1 Oreo, MIUI for POCO also prioritizes security with regular patches and updates from Google. It will receive the Android P update in the near future. To fully unleash the performance beast, MIUI has been deeply customized on POCO F1 for a lighter, faster, and smoother experience. It features a system optimization feature called "turbocharged engine", POCO F1 delivers faster app startups, faster gaming performance, as well as a faster swiping experience due to enhancements in the screen response and animation frame rate. POCO F1 sports a AI dual camera consisting of a 12MP Sony IMX363 primary sensor with Dual Pixel Autofocus. On the front, POCO F1 deploys a 20MP sensor featuring Super Pixel technology that combines the information of four pixels into one large 1.8µm pixel for clearer images with less noise. Both the rear and front cameras are supported by AI features for photos, such as AI Portrait, AI Beautify, and AI Scene Detection. There is also a rear-mounted fingerprint sensor. The POCO F1 has various connectivity features including dual-SIM, dual 4G VoLTE, Bluetooth 5.0, Wi-Fi 802.11 a/b/g/n/ac, GPS+GLONASS, 3.5mm audio jack and a USB Type-C port. At the event, POCO F1 Armoured Edition with a back panel made of DuPont Kevlar also made its debut. The super-tough, heat-resistant material is widely used in the aviation industry, the military, and high-end cycling. Its textured surface gives POCO F1 a unique appearance and provides a comfortable grip. POCO F1 is also available with polycarbonate backs in Graphite Black, Steel Blue, and Rosso Red. POCO F1 will retail at INR 20,999 / ~$300, INR 23,999 / ~$343, and INR 28,999 / ~$414 for the 6GB+64GB, 6GB+128GB, and 8GB+256GB respectively. The Armoured Edition comes in a single 8GB+256GB configuration and will retail at INR 29,999 / ~$429. It will hit the shelves in India on 29 August, and roll out around the world gradually.